Location: South Palm Canyon Drive, Palm Springs. From I-10, take the exit for highway 111 (which happens to be exit #111) and head southeast for 9.4 miles to downtown Palm Springs. Continue onto North Palm Canyon Drive for 3 miles and bear right onto South Palm Canyon Drive. In 1.8 miles, turn left onto Bogert Trail. Go 1.1 miles and turn left on to Andreas Hills Drive. The trail head will be on the left in 0.6 mile, at the corner of Andreas Hills Drive and Bogert Trail. Alternately, from the east, take I-10 to Bob Hope Drive (exit 130). Turn left on Bob Hope Drive and go 0.4 miles to Ramon Road. Turn right and follow Ramon for 6.7 miles to Sunrise Way. Turn left and go 2.3 miles (Sunrise Way becomes La Verne Way) to South Palm Canyon Drive. 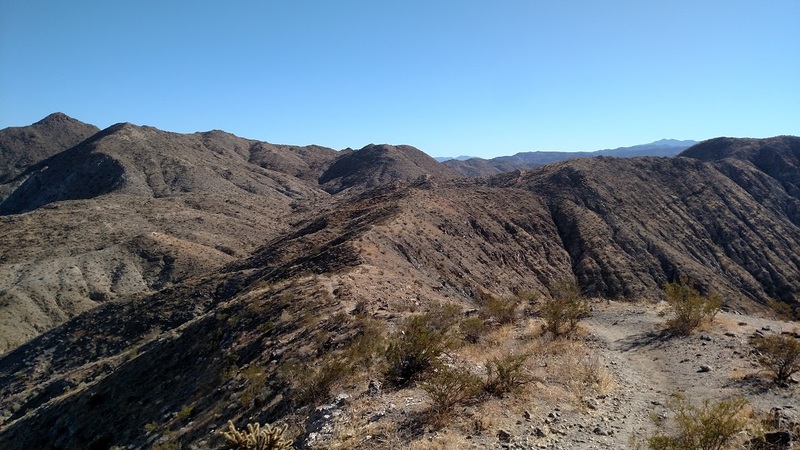 Turn left and follow South Palm Canyon 1.2 miles to Bogert Trail and continue as described above. 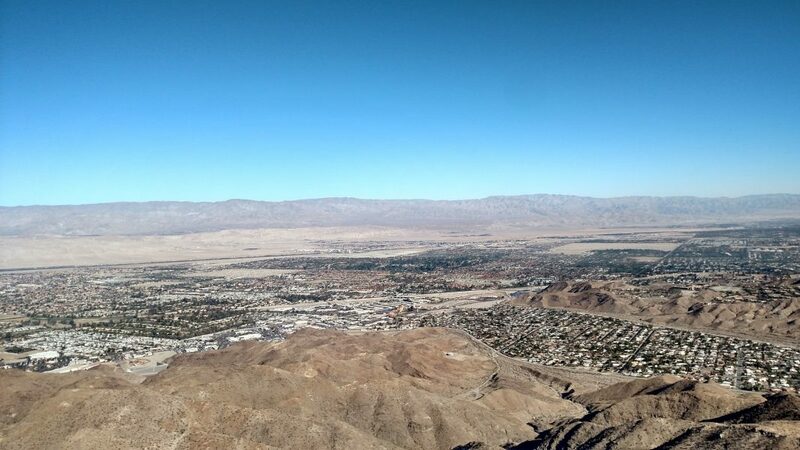 It may be surprising that one of the best views in Palm Springs, a city that sits beneath a mountain range that towers nearly 11,000 feet, can be found from a summit with a seemingly unimpressive height of 2,207 feet. 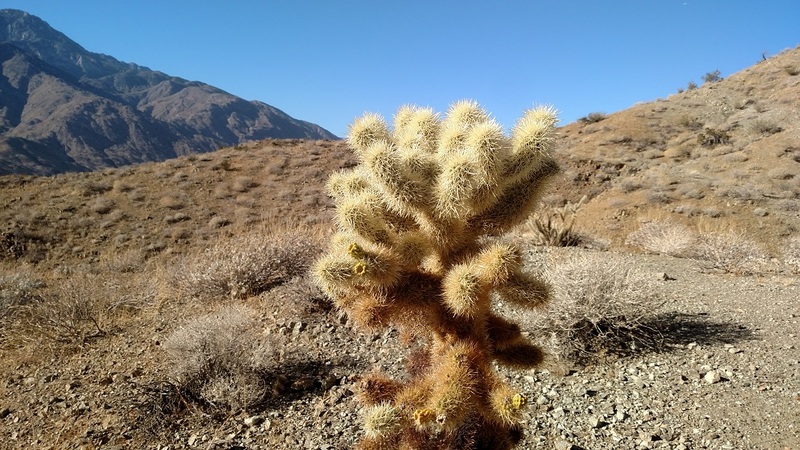 However, not only does Murray Hill offer outstanding vistas of Palm Springs, the Coachella Valley and the surrounding mountains but it is also a much more challenging hike than its modest height would suggest. There are several possible routes to the summit, all of which require significant elevation gain and several miles on exposed trails. 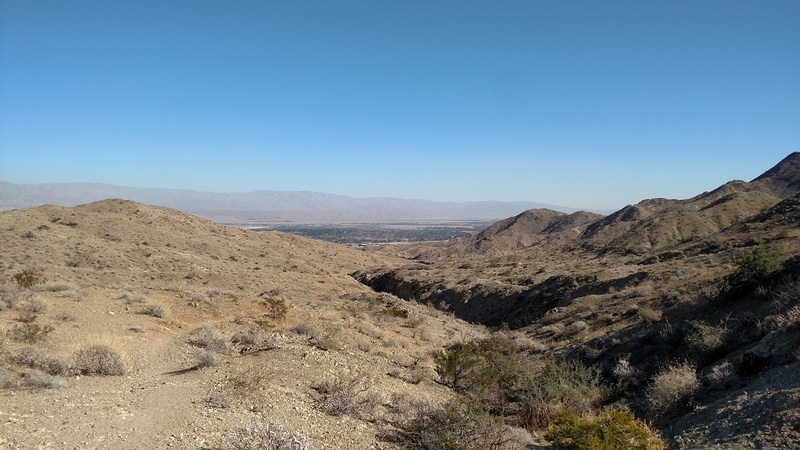 This write-up describes an approach from the west, using a relatively new trail named for Frank Bogert, former mayor of Palm Springs (Sonny Bono’s predecessor) who was also known as an actor, rodeo announcer and racquet club manager. The trail was dedicated to Bogert a year after his death in 2009 at the age of 99. From the corner of Andreas Hills and Bogert Trail, head up the concrete walkway to the official Bogert Trail Head, on the right. The trail starts off as a fire road, curving through the hills above the houses, briefly dropping to a saddle (a use trail has been built to bypass a section of the road that is washed out as of this writing) and then beginning a steady climb, picking up almost 500 feet in about 0.8 mile. Once you reach the ridge line, the ascent becomes more moderate and you soon arrive at a saddle (1.7 miles from start). At this point you’re just about half way to the summit, although most of the elevation gain is still ahead of you. The Garstin Trail, a popular route for this hike, comes in from the left. Your route is the Wildhorse Trail, which ascends steeply to the right. 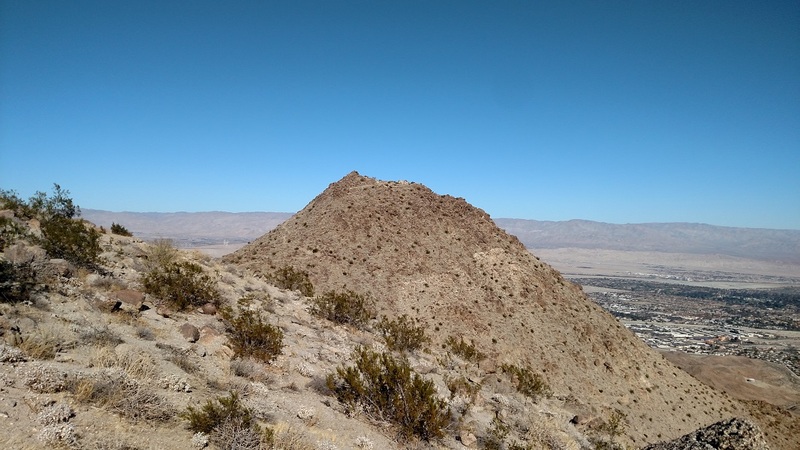 A climb of about 400 feet in 0.6 mile brings you to a bump on the ridge, where you will be rewarded with wide-ranging views in all directions, notably of the Santa Rosa Mountains to the south. The highest peak in the range, El Toro, is recognizable by its distinctive twin peaks. The trail briefly drops from the bump and follows the ridge southeast, reaching a junction with the Clara Burgess Trail at 2.8 miles. From here, head left on the Clara Burgess Trail (the Wildhorse Trail heads south toward the Indian Canyons). The Clara Burgess Trail heads northeast, climbing steeply to a ridge. Once you reach the top of the ridge you will see Murray Peak directly in front of you. Follow the trail as it drops briefly to a saddle and then makes a final steep push to the top. 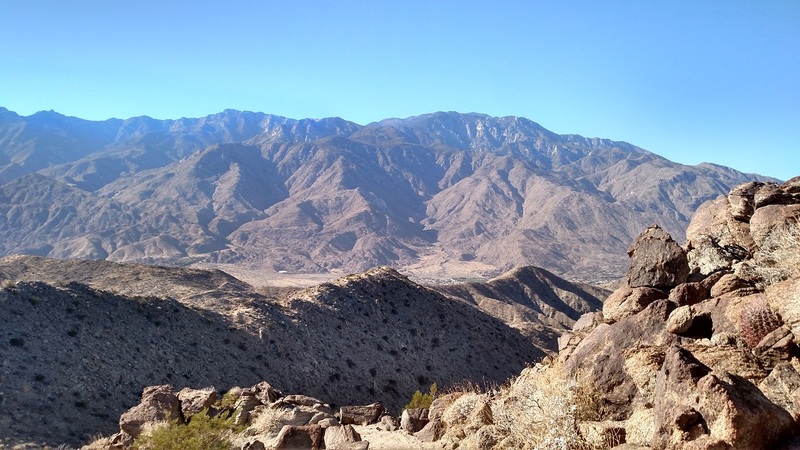 Here, your efforts are rewarded with views of San Jacinto, the Little San Bernardino Mountains, the Coachella Valley, Palm Springs and the Santa Rosa Mountains. You sit at a picnic table and enjoy the scenery or make a short climb up a few rocks to get to the true high point. After resting your legs for the steep descent, return via the same route. 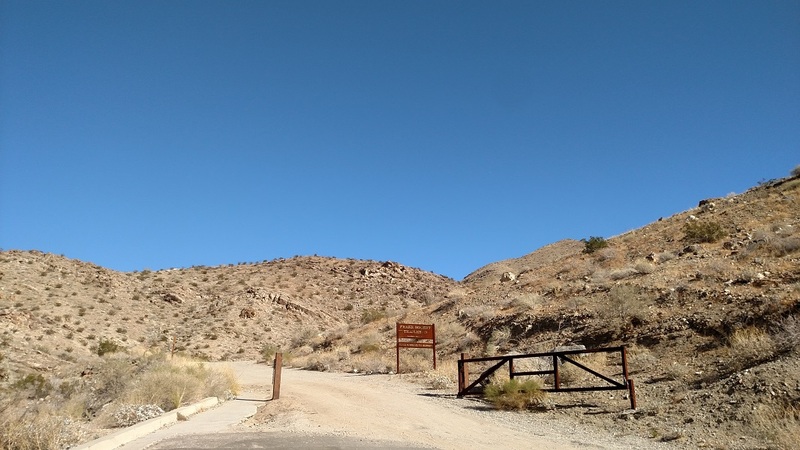 For variety, you can also return via the Garstin Trail by staying straight at the saddle and following it to the junction with the Berns Trail just below Smoketree Mountain. From here, head left on the Garstin Trail, follow it downhill to the trail head and complete the loop on the residential streets. This option adds about 0.9 mile and 200 feet of elevation gain.